Voting is an important civic responsibility and one way all of us exercise and enjoy our Sovereignty. This responsibility becomes particularly important during a Presidential Election, because of the immense power vested in this office. With just a few days more for the 2015 Presidential Election, follow and support #IVotedSL, a trilingual campaign launched by Centre for Monitoring Election Violence (CMEV) to encourage citizens to exercise their right to franchise. Why should you care? 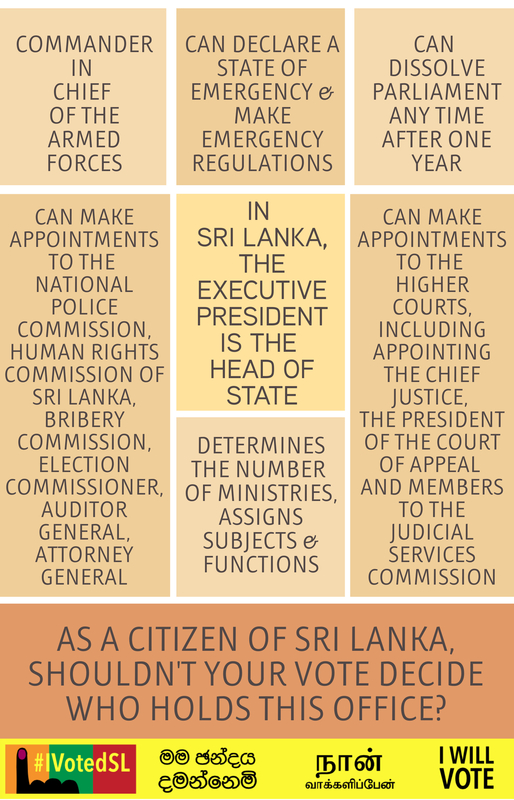 For starters, see the vast powers the office of the Executive President commands in Sri Lanka. Today, we release another infographic around how one in four registered voters in Sri Lanka, in the past, have not voted at a Presidential Election. We can and must change this. Change your profile today encourage your friends, family and colleague to go out and vote. To access our badges, logos and profile pics click here.